Microsoft Office Outlook program stores all its data such as your email messages, calendar, tasks, and other items in special files called Personal Folders Outlook Data File with .PST file extension (or less importantly, .OST offline Outlook Data File for Exchange account). The data files is used by almost all version and editions of Outlook products, including Outlook 2000, Outlook 2002 / Outlook XP, Outlook 2003, Outlook 2007, Outlook 2010, Outlook 2013, Outlook 2016 or later. The .PST files are hidden inside a deep rooted nested folder under respective user directory. 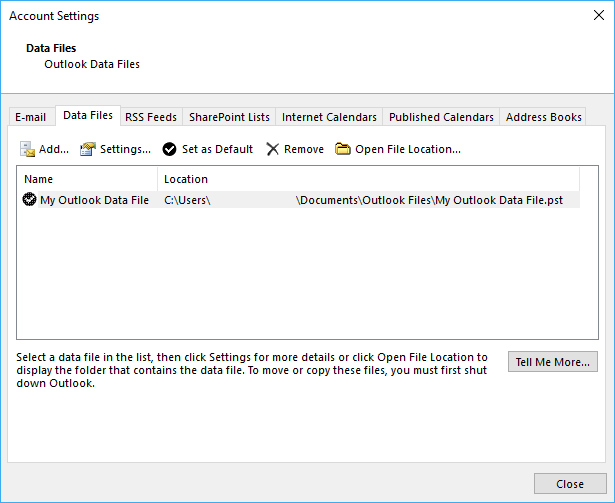 If you want to copy out and backup the Outlook .PST data files without using Personal Folders Backup add-in, here’s an easy way to locate and open the folder that contains and stores these files. In the Folders’ Navigation Pane, right-click Personal Folders, My Outlook Data File, <email address> or the name that appears for your .PST file, and then select the Properties or Data File Properties in the context menu. Note: This folder will always be a top-level folder in the Navigation Pane, in Mail. And there is one Outlook Data File for each email accounts unless configured otherwise. In the Filename text box, the complete path and file name of the .PST file will be shown. If you’re using Outlook 2007, you can also go to File menu, then select Data File Management. In Outlook later than Office 2010 (such as Office 2013, Office 2016 or later), you can also go to File menu, then click or tap on Account Settings -> Account Settings. Then go to Data Files tab. You will see a list of all data files used by Outlook, including archives, if any. Simply click on the data file you want to know its location path, and then click on Open Folder… or Open File Location… button. A Windows Explorer window will open and go directly the the storing folder.